Bad news… the place where the car was parked (broken down!) now was in the way of the garbage truck when it came. The police were called and an inspector came looking for me at my apartment. I wasn’t home so he left his name and number with my neighbour. Good news… last week I had prayed for opportunities to meet my neighbours. When I got home from prayer evening on Tuesday I met my neighbour Boris, who came to tell me to call the police inspector. Later I had the opportunity to meet several other irate neighbours who went out of their way to let me know how bad it was to leave my car in the way of the garbage truck. I had the opportunity to apologize profusely. Good news… early on Wednesday morning, my team-mate Mike came to help me get my car moved out of the way. A taxi driver with booster cables got me started and Mike followed me through the snowy streets to the OM base, arriving in time to lead the Bible study that I was responsible for that morning. 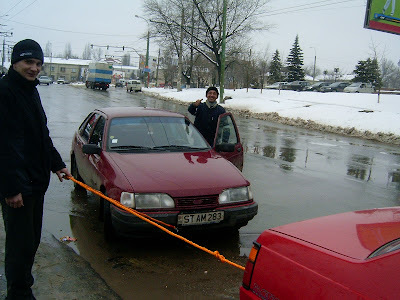 Good news… a brother from a local church saw me there and helped push the car out of the way. Then Lilian came to help get it started, without success. 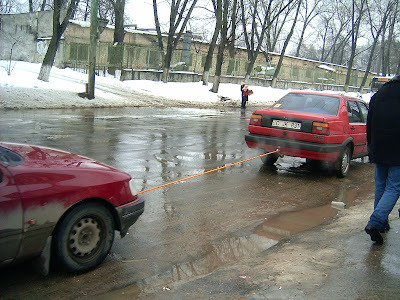 Then Andrei the mechanic arrived and towed it away to be repaired. Bad news… Lilian had tried unsuccessfully to call the police inspector on my behalf; when I got home, the police called me and told me to come to the Police station in the morning. Good news... nothing had been taken. The policeman took all my legal car documents that I had left in the car and gave them to me when I came to the police station, and also locked the door. My tape player was not stolen. More good news… Later in the day, Andrei arrived with my car all fixed and ready to go. Bad news… On the way home, I got pulled over by the police for going through a red light (in reality the light was green but there was a green right turn arrow that I didn’t know about and you can’t turn right unless the arrow is green, but there’s no red arrow to indicate that – you’re just supposed to know)… so I got another ticket! Good news… When I think back over the course of this week and of all the people who helped me in my misfortune – I counted at least twelve – I can only thank the Lord Jesus that I am not alone. He has put me in a place where I always have someone I can phone for help. Praise His name! More good news... I found the secure parking lot near my building where I can safely leave my car, as there is a security guard. You may wonder if, in the midst of all this, I ever do any work or ministry. In fact, although my time at work has been limited this week, I did lead a Bible study and spend some meaningful time with individuals and started preparation for our ‘Challenge into Missions’ training program that begins next week and answered a lot of e-mails and did some planning for the future programs that will be conducted in our new building. We have had a conference going on at our base this week, too, so it has been good to have some time to meet people from away.. thank you for your prayers in and through all things! Posted by Barb at 8:14 a.m. I'm so glad to hear I'm not the only schmoze! What is life but adventure interspersed with extreme boredom! It's always a great ice breaker to get the neighbors ticked right off at you. I'm sure you'll be on the top of their social calanders now. Hey lets invite that foreign chick, I'm sure she'll provide the entertainment for free!